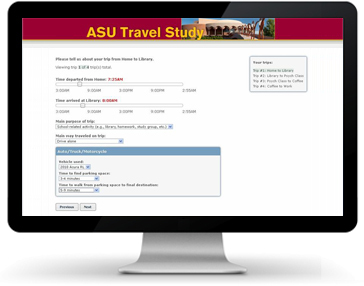 Arizona State University Travel Diary Survey | Resource Systems Group, Inc.
RSG conducted a one-day travel diary survey in collaboration with Arizona State University (ASU) for the Maricopa Association of Governments (MAG). ASU is one of the largest universities in the United States with 70,000 students located at the main campus in Tempe and three satellite campuses in the Greater Phoenix region. On a similar scale, more than 13,000 faculty and staff work at ASU. 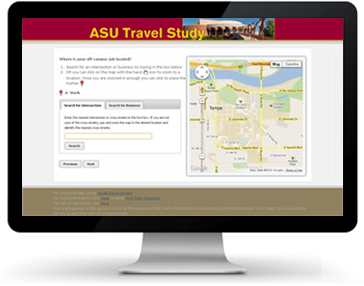 This special generator travel diary survey was administered to students, staff, and faculty and collected detailed information about their socioeconomic, demographic, and travel demand characteristics in support of the region’s development of an activity-based travel demand model. More than 12,000 students, faculty, and staff completed the survey, with two-thirds taking it within 24 hours of receiving the initial email invitation. The data gathered in this survey are instrumental in informing MAG’s transportation and socio-economic planning activities for the region.